Thread: Windows fails to load. When I power up my laptop I get a “windows error recovery screen” which has two options. If I select load normally, it fails and returns to the recovery screen. If I select Start-up repair, I get the Windows Corp screen with loading bar and then a blue screen with symbolic bird on it and after that nothing happens. I have also tried re-starting with F4 to select Samsung recovery and this leads to the Solutions 4 screen but nothing happens after that. What can I try next please? The machine is a Samsung R530 running Windows 7 with Norton Antivirus software. Can you boot to the Advanced Boot Options menu? Please try that by rebooting the computer and begin tapping the F8 as soon as it starts. Do you have the Installation CD to perform a Repair Install? A recovery disk will not work for what we need at this time. Exactly what disks do you have in your possession? Can you borrow a Windows 7 Retail Installation disk from a friend? Is Advanced Boot Options menu another name for Setup utility? The reason why I ask is that F8 doesn't cause anything to happen but F2 causes Setup utility to appear. Is Advanced Boot Options menu another name for Setup utility? No. Setup Utility is to access the BIOS to configure boot options, etc. Keep trying to restart your computer and tapping the F8 key to see if you can get to that screen and choose Repair Your Computer. You could even try the Last known good configuration option listed there. Let me know if you can get that far. Exactly what disks do you have in your possession? Can you borrow a Windows 7 Retail Installation disk from a friend? Last edited by DonnaB; 04-05-2013 at 09:48 PM. I can now get to the Advanced Boot Options screen. I have tried both the “Repair your Computer” and “Last Known Good Configuration” options but to no avail. 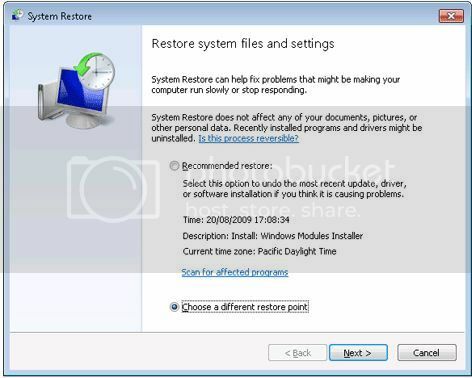 For example, if I select “Last known good configuration”, it is followed by the Starting Windows screen , the blue Samsung recovery screen and then the Windows Error Recovery screen. When I select “Launch Startup Repair” its followed by the Window is loading files screen, then a blank screen and finally, much later, by a blue screen with a silhouette of a bird and a leaf. This screen is the end point because it contains no icons and there is no response to keyboard other than moving the cursor with the touch pad. The only action is to turn the power off. I do not have a Installation CD to perform a Repair Install. No discs were provided in the purchase but I did follow instructions and made a Samsung System Repair disc. I have not been able to borrow a Windows 7 Retail Installation disk. It seems that they are not now supplied with new laptops. I note that there is a product key for Windows 7 attached to the base of the laptop. Would this enable me to download it from the internet? Question: is a “Installation CD to perform a Repair Install” another name for a Windows 7 Retail Installation disk? I appreciate the help that you are giving me. Please ignore your double post above. Seems we're having some technical difficulty and the Admins are working on it. Have you tried using the System Repair disc? Was Win7 the original OS that came installed on this computer? I want to make sure that product key is for the OS installed. Yes. I know of a way to legally download a Win7 ISO from online and that product key will make it a legit copy and is perfectly legal since the key is what you pay for. You may have to go to the manufactures sites to download and drivers that may not be included with a "bare bones" ISO that is downloaded, though, such as a web cam driver, etc. and you will lose all your personal data, etc. if this decided upon. Bare bones means that no programs will be listed in your Programs and Features. I'd like to save this as a last resort if possible. Allow me some time to search around to see if I can find a better solution to this problem. Yes! Pretty much so. Though it may be an installation disk provided for that particular computer if it is a Samsung disk. Usually when a recovery partition is not included with the computer you are given the opportunity to create recovery disks from the recovery manager that is included or you are provided with an installation disk for that computer from that manufacturer which is Samsung. A retail disk is one that is purchased in the store that can be used on any computer no matter who the manufacturer is. Have you recently added any new hardware to the laptop? Unplug the power cord, then any non-essential peripherals attached such as a printer, scanner, webcam, zip drive, phone cord, network cable, and other devices. Make sure there is no disk in the optical drive. If the monitor displays a message, allow the timer to count down to zero. Reboot into the Advanced Boot Options menu. 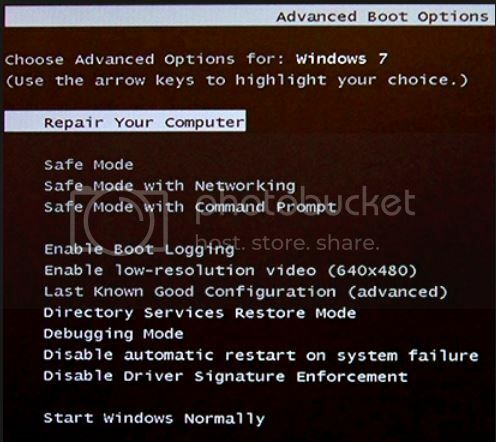 Navigate to Safe Mode with Command Prompt and press Enter. When the login screen is displayed, select Administrator , and type the password (if applicable). Click on Choose a different restore point , and then click Next . Select a restore point before the errors began to occur, and then click Next . Follow the on-screen instructions to restore the computer to a time when the errors did not occur. Answer to “Have you tried using the System Repair disc?” – Yes, the sequence was: Change boot order to cd/dvd drive, insert Samsung repair disc, confirm loading from CD/DVD, windows is loading files screen, blue screen with bird, system recovery options box, select ”next”, blue screen continues but nothing further occurs. Answer to “Was Win7 the original OS that came installed on this computer?” Yes. Reference to “Usually when a recovery partition is not included with the computer......” the the drive is partitioned. Answer to “Have you recently added any new hardware to the laptop?” No. Result of trying “•Unplug the power cord...........” Ultimately, it ends with the blue screen. Result of trying “•Reboot into the Advanced Boot Options menu.......” followed procedure to “Navigate to Safe Mode with Command Prompt and press Enter”. This resulted in Loading windows files screen with many lines beginning Loaded; Windows\system32\drivers\....., then a blank screen followed by the Samsung screen and then the Windows Error Recovery screen etc., leading ultimately to blue screen. I have tried this three times but have failed to get to the adminstrator’s screen. Look forward to the next step!